There is pretty much no end to the dedication I will show in order to cobble together a dessert. If I can make this dessert by mining the depths of my refrigerator, even better. There is satisfaction to be found in saving food from eminent disposal, sure, but one can definitely intensify the delight of that satisfaction by churning out a dessert so unexpectedly fantastic, so effortlessly decadent, you might just have trouble believing that this delicious thing you just Frankenstein-ed into existence is a hodgepodge of leftover bits and pieces from other meals. 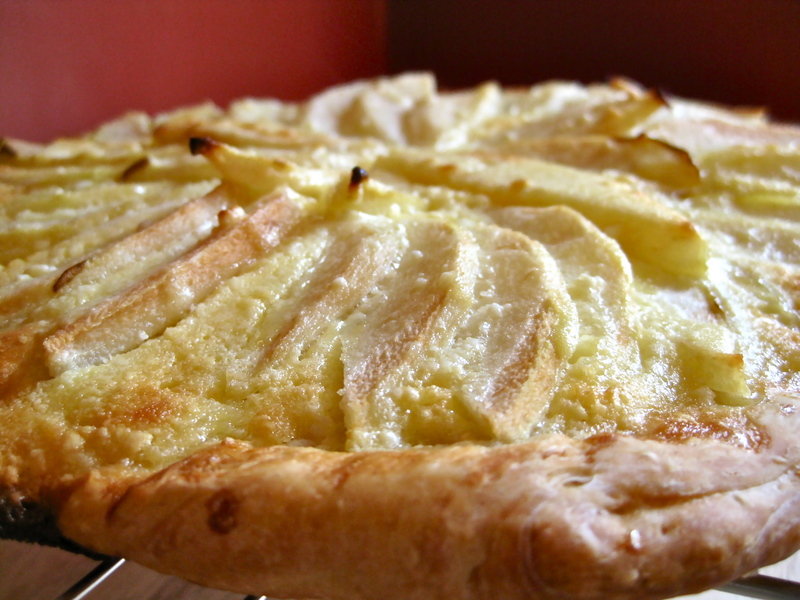 While it’s true that this recipe is based on using up a bit of leftover pizza dough (and by based, I mean that both literally and figuratively, since the pizza dough provides a crispy base for the pears and mascarpone, but also serves as a nice method for utilizing the last third of a batch of this dough), it by no means tastes like a second rate dessert. That a very simple combination of ingredients can be joined together to make something this incredible seems almost unfathomable. Softly sweet mascarpone cheese is baked into a deep, caramelized custard while it sits atop a bed of simple, fresh pears. The humble pizza dough base, previously left to rest in the refrigerator for several days, transforms into a flaky, crispy pastry that achieves all the flavor of a Danish pastry dough, only with none of the work involved. To top off the list of this dessert’s nearly unbelievable attributes, the entire thing, luscious and toothsome as it is, is made with a total of only three tablespoons of sugar. Truthfully, I am finding it exceptionally difficult to do anything other than gush about this luxurious pastry concoction, because, to be quite honest, I had no idea it would turn out this good. When I took a bite of it, I actually froze a little and thought, “What IS this?” Even though I knew exactly what it was, since I had just taken the time to make it. Now, one week later, having worked my way through several bites, I feel a bit more prepared to answer my own question. What is this? It is simple, it is delightful, and it is not to be missed. Interested in more ways to use up refrigerator leftovers? Here is another scavenger recipe of mine that was posted on Indie Fixx, where I write a regular food and cooking column called Melting Pot. 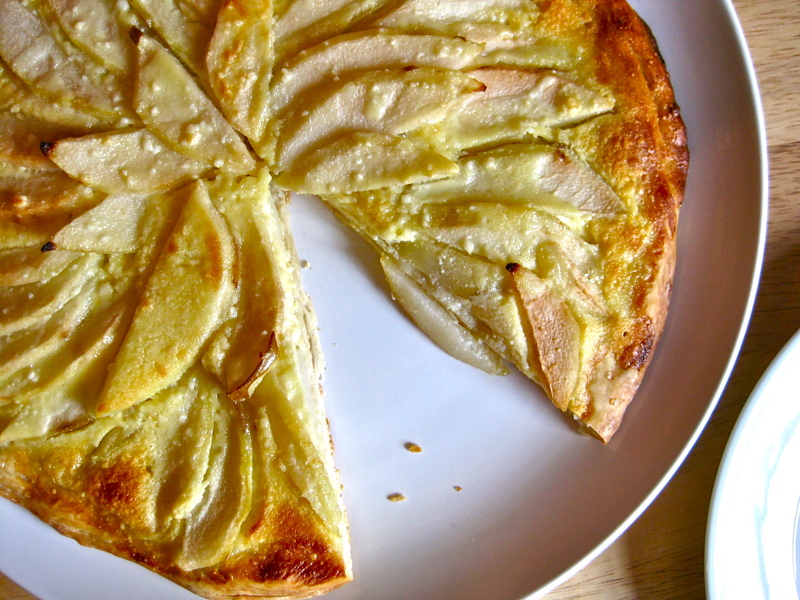 If I were to make one very important suggestion about this dessert, it would be that you use a very well-rested pizza dough that has had time to ripen in the refrigerator. What do I mean by ripen? Well, the longer you let your dough rest in the refrigerator, the more time you are giving the enzymes in the flour to convert to sugar. 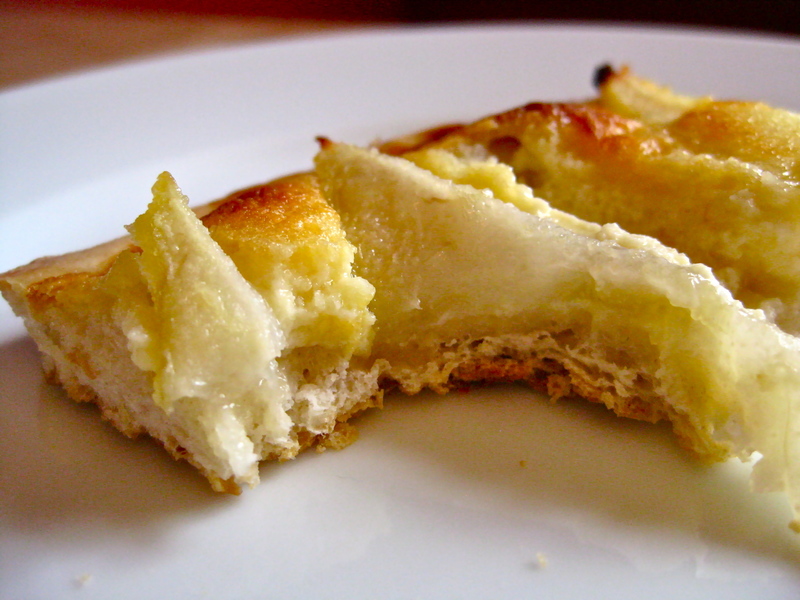 This extra bit of natural sweetness in the dough not only gives it a great flavor, but it also allows the dough to caramelize a bit while baking in the oven, giving the dessert base a much more intense flavor and pronounced crispness without the need for added butter or sugar. Hand stretch dough into a 12-14 inch round. Place dough on a parchment-lined baking sheet. 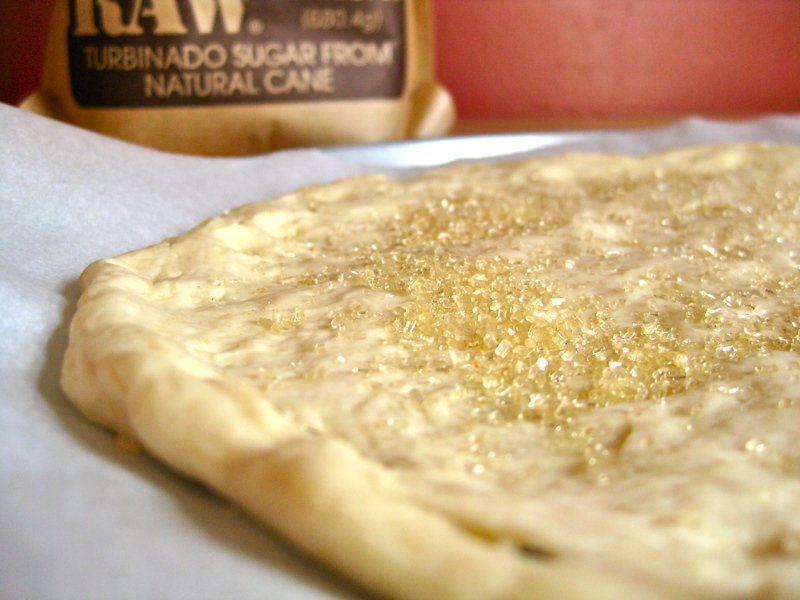 Sprinkle half a tablespoon of turbinado sugar over the surface of the dough. 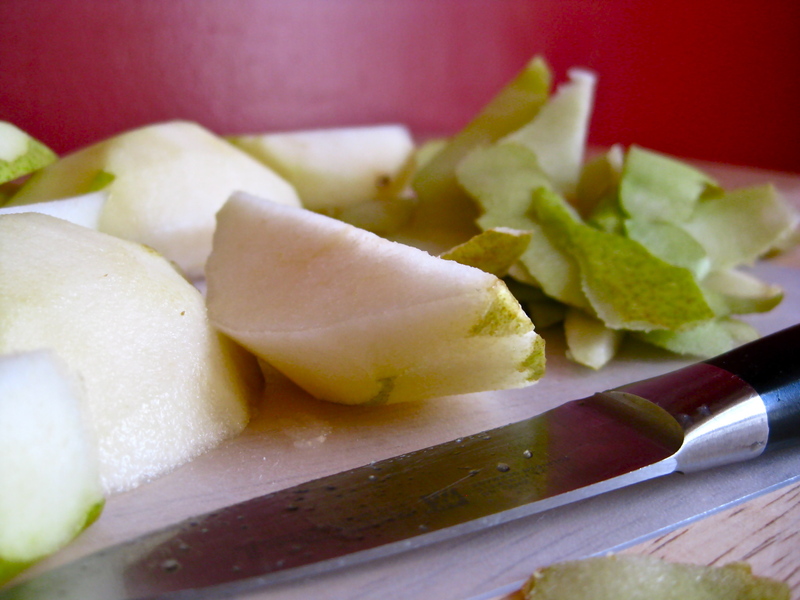 Reserve the remaining half tablespoon of turbinado sugar and set aside. 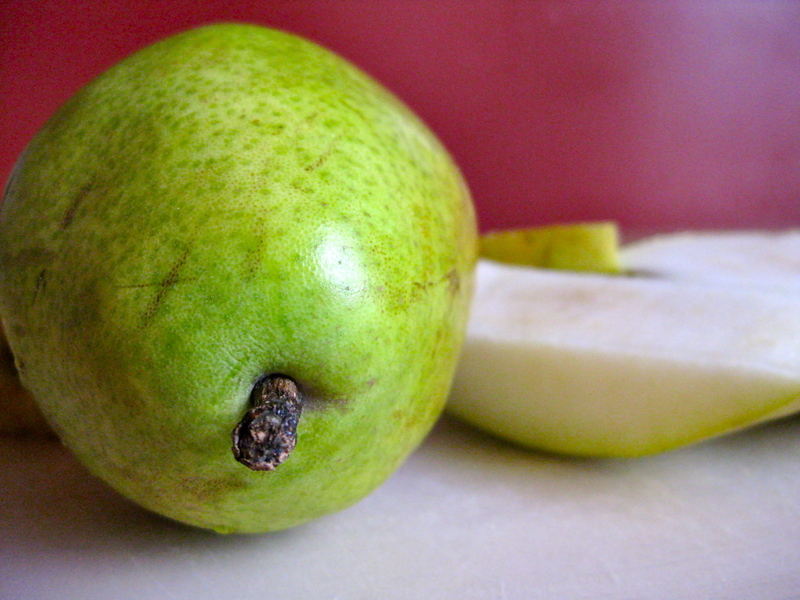 Arrange the sliced pears over the top of the sugar-sprinkled dough. I found it very easy to fit all the slices neatly on the round by arranging them in concentric circles, but you may arrange the pears however you want. 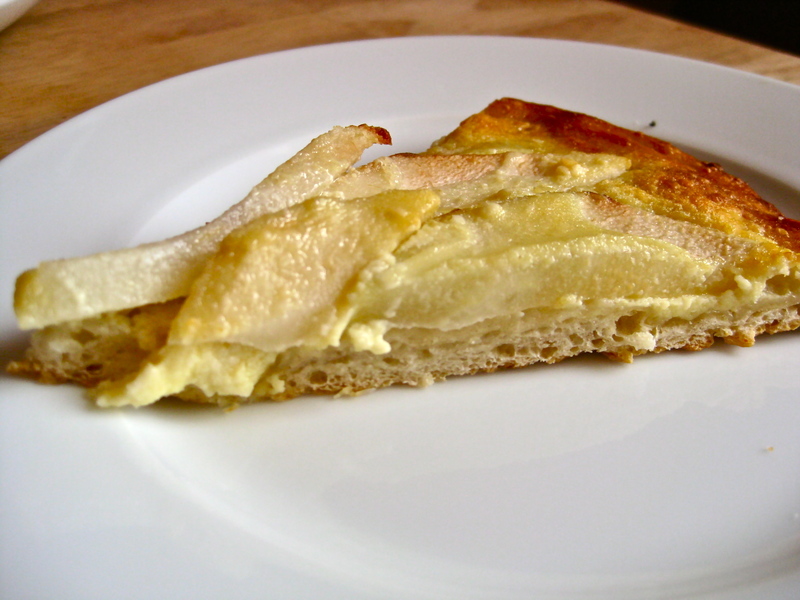 Combine the mascarpone cheese, egg, white sugar, lemon juice, and vanilla. Whisk thoroughly to combine. Drizzle the mascarpone mixture evenly over the pears, covering as much of the surface as possible, but leaving a 1/2 inch of dough uncovered at the edges. 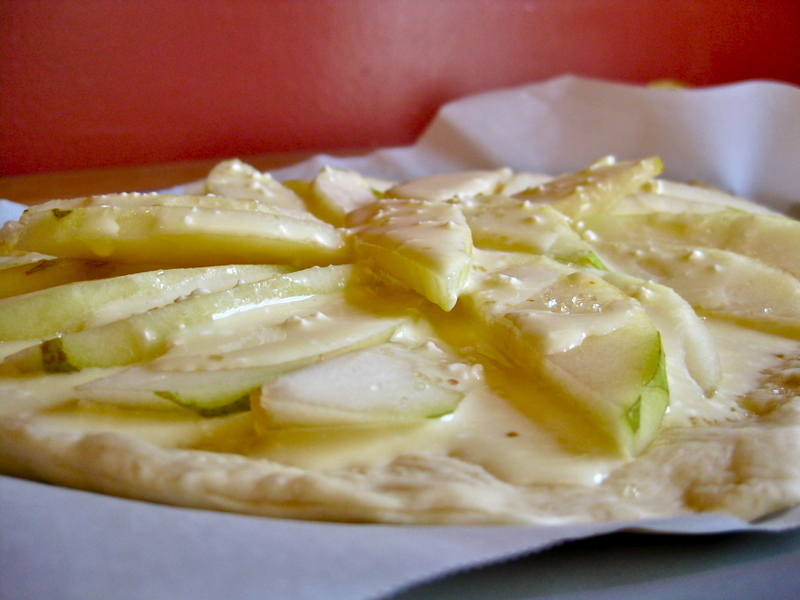 Sprinkle the pears and cheese with the remaining half tablespoon of turbinado sugar. 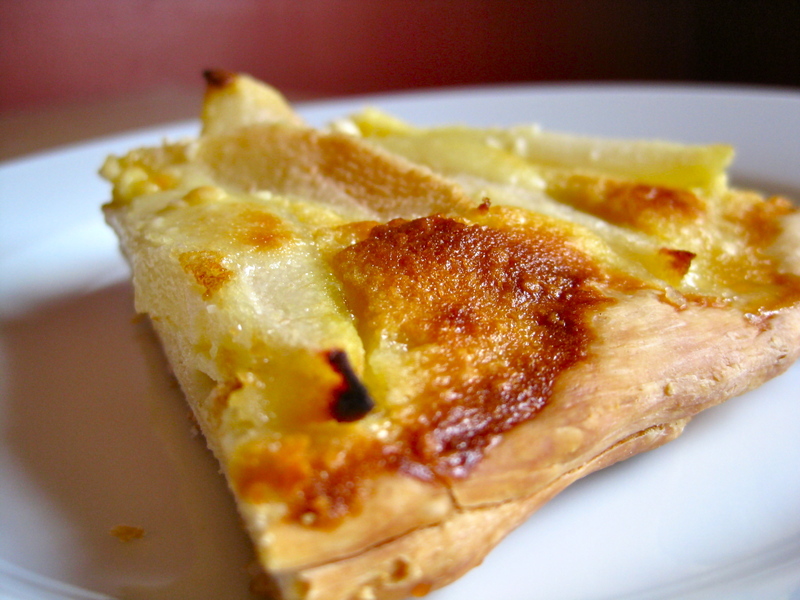 Bake pizza for 25-30 minutes, until the cheese has caramelized in places and the edges of the dough have turned golden. Cool slightly before eating.